My third Cuban adventure. You can see images from the last visits here. The first thing I did, when I woke the first morning, was walk to the malecón as the sun came up. There were already fishermen perched on the wall, indifferent to the waves that lashed the defences. My first visit had been in 1998, then in 2002 I returned for work and was a little shocked at how much it had changed. I expected even bigger changes this time around, but apart from Havana Vieja being completely given over to tourism, it seemed pretty much as I remembered it. Of course it is much more open to free enterprise, so eating out is now fraught with the dilemma of choice, and not the quest for anything half-edible. The other thing that was the same as I remember, was the light at night, notable as much by it’s absence, as it’s lurid tungsten and fluorescent hues. But now this was augmented by the clean white light of modern technology; the mobile phone had arrived. 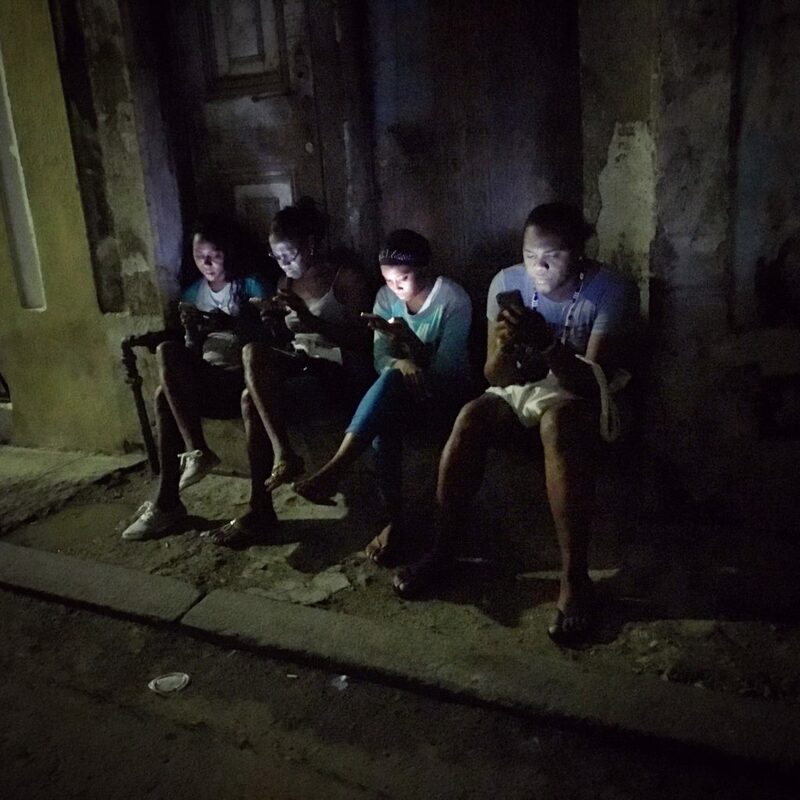 All life in Havana in on the streets, sat in doorways, hanging on the corners, everyone chats and occasionally does business there. Now, because of the new technology and the precious few wifi hot-spots that exist, you have a new phenomena; people gathering like moths to a flame, looking for connections, though not with the people they huddle with. As a photographer it made for some interesting shots, self-lit as they were, it gave a novel twist on the self-obsession of selfies… they were oblivious to me taking pictures. It is easy to see this change of behaviour as a corroding of the old social fabric. I am not sure what I think, but I did often feel I was awake and walking amongst the sleep-texting people and their dreams in a crumbling city.